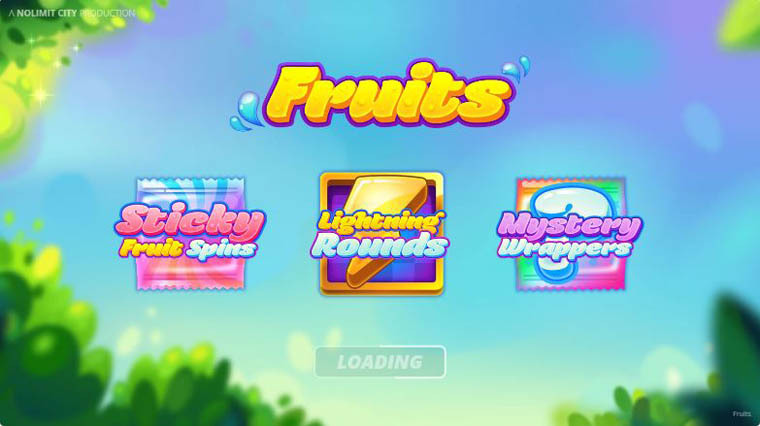 How about a Fruit themed online video slot that feels more like a casino version of Candy Crush? With Fruits, provider Nolimit City has set the bar high in the fruit themed slots industry. The unique grid design with six reels and 2-2-3-3-3-3 rows, the neatly designed symbols are just starters. The real fun begins with the three main bonus features: Sticky Fruit Re-spins, Lightning Rounds, Mystery Wrappers. With as little as €0.20, you can start spinning this medium volatility and 96.23% RTP game. An impressive 116 ways to win are waiting to be discovered and, at any spin, the mystery wrappers random feature might be triggered. When it activates, 4 to 9 positions will get a Mystery Wrapper overlay and will all reveal the same symbol. Except for the Lighting symbol, anything can be revealed by these wrappers. A Blue Star plays the Wild, and it will substitute for all other symbols except for the scatter to help make more lucrative combinations and trigger more fruitful paylines. And then there are the Sticky Fruit Respins, triggered by landing four instances of the same symbol on the first two reels of the main game. As long as you land additional winning symbols (identic to the ones that have triggered the feature), then the feature continues. The second kind of freebies is the Free Spins. Landing 3 or more Lightning Bolt Scatters will grant you 5 Free Spins. During this feature the key is to collect as many extra Lightning Bold symbols as possible, thus reaching a maximum of 100x multiplier and 25 spins. Why play it: It looks like a Candy Crush game, it feels like an incredibly nifty online video slot, and it incorporates treasures fit for royalty. This fruit themed online video slot goes beyond the borders of previous classic video slots and into the land of really fun and modern games.